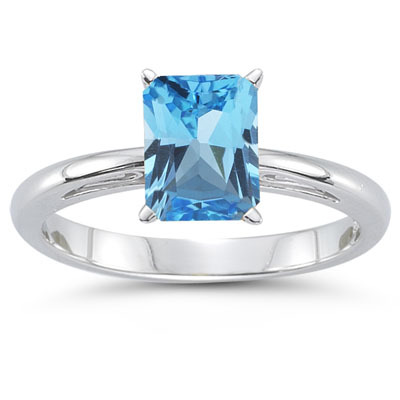 5.89 Cts Swiss Blue Topaz Solitaire Ring in 14K White Gold . This tantalizing Swiss Blue Topaz Scroll Ring is highlighted with an AAA quality emerald-cut Swiss Blue Topaz Solitaire prong set in 14K White Gold. Approximate Gemstone Weight: 5.89 Carats. Embrace glamour with this tantalizing ring.